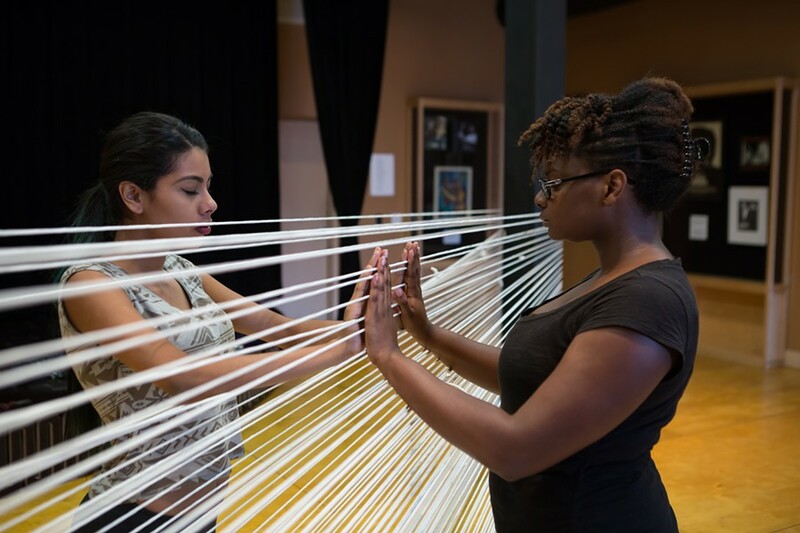 Bert Johnson Patricia Barajas and Simone Nalls practice a piece for The Anastasio Project. In June 2010, undocumented immigrant Anastasio Hernandez Rojas died near the border between San Diego and Mexico a few days after being beaten and tasered by border patrol officers. While the incident happened more than five hundred miles from Oakland, the NAKA Dance Theater will connect his tragic story to those of Oakland residents in a performance at the EastSide Arts Alliance (2277 International Blvd., Oakland) this September. 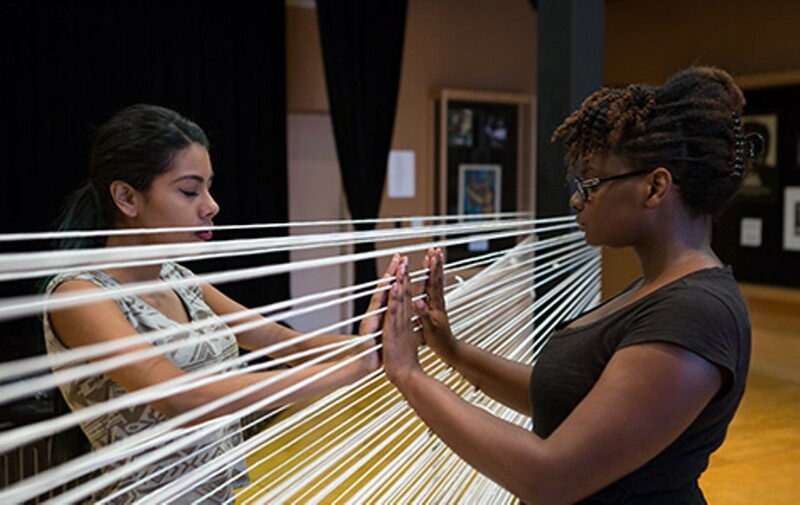 José Navarrete, one of the two co-founders of NAKA Dance Theater, first learned about Hernandez Rojas' story from a student's spoken-word performance at MetWest High School in Oakland. Intrigued by the powerful piece, he went online and began reading about the incident. Initial reports suggested that Hernandez Rojas was hostile and resisting deportation, but an investigation by PBS Need to Know and the Investigative Fund of the Nation Institute later revealed that the agents might have used excessive force, prompting a congressional inquiry. "It really impacted me so much. It took me to a place in which humans went so far to create so much pain to a body," said Navarrete. "Anastasio was screaming, 'Please stop.' It was like watching a guy being murdered. I felt like — wow, what is this? How far have we gone?" Wanting to share Hernandez Rojas' story in a more poetic way, Navarrete approached his dance company partner Debby Kajiyama about creating a multimedia piece exploring the incident. For the two dancers, examining social justice causes through their productions is nothing new. After forming their company in 2001, their work evolved to focus on social and environmental issues, such as the genetic modification of crops, the nuclear disaster in Japan, the Gulf oil spill, and immigration. As artists in residence with Oakland's EastSide Arts Alliance, Navarrete and Kajiyama brought the idea to the collective of artists and community organizers of color. The story immediately resonated with members of the group. "For the past four years we had been focused on the issues of police brutality, racial profiling, and immigration rights," said EastSide's administrative director Susanne Takehara. "It's an issue that's right up in front of us, so it was a natural connection." The members then asked Navarrete and Kajiyama to expand upon their idea and investigate the similarities between border violence and violence happening on the streets of Oakland. In order to link Hernandez Rojas' story to the lives of Oakland residents, Navarrete and Kajiyama conducted interviews with people affiliated with the alliance. "Every single one of them talked about police brutality that they've experienced, either themselves or their father or their brother," said Kajiyama. "We learned about gang injunctions, the school-to-prison pipeline, and all of the dots that connect with that issue. There's a huge structural aspect of the oppression that happens both at the border and in the streets of Oakland." For Dajuan Carter-Woodard, a performer in the production and teacher at the Alliance, Hernandez Rojas' story hit especially close to home. Carter-Woodard was a friend of Oscar Grant, a young African-American man who was killed by a BART police officer in January 2009, and he noted the similarities between the violence perpetrated by border patrol agents, and the violence of police officers in the United States. "What's the difference between [what happened with Anastasio] and what happened with Eric Garner in New York? What's the difference between that and Oscar Grant?" he asked. "It's someone in a place of power that feels like my life isn't good enough to even be worried about." Ultimately, Navarrete and Kajiyama incorporated Hernandez Rojas' story, the experiences of Bay Area residents, and the interviews with Alliance members into a multimedia piece investigating race relations, border violence, and state brutality. The mobile performance, which moves fluidly from indoors to outdoors, involves movement, dance, spoken word, poetry, and installations, and also features video created by Steven Sanchez, original music composed by David Molina, and a mural by artist Leslie Lopez. The seven performers include Navarrete, youth and adults affiliated with EastSide Arts Alliance, and two youth from San Francisco. In addition to pieces directly related to Hernandez Rojas' story, such as a poem and dance inspired by his autopsy report, the show will include scenes illustrating how performers have confronted violence here in the Bay Area. For example, the two San Francisco youth will perform a movement piece wherein one recalls discovering a bullet hole in his bedroom window when he was in elementary school, and another reflects upon a time he was stopped by the police in San Bruno due to racial profiling. The performers and members of the collective have high hopes for the production, believing that telling stories about violence and racism through the arts affords a unique opportunity to sustain people's interest in a serious issue. "A lot of people have the attention span of a hamster," said Carter-Woodard. "But when you entertain people and give them something that will visually amaze them or stimulate them, that gives them something that sticks in their heads." Navarrete and Kajiyama plan to premiere The Anastasio Project at EastSide Arts Alliance and to later perform excerpts of it at various festivals in Oakland. Their hope is that the production will inspire empathy in audience members and that it will be a first step toward changing the way people think and talk about race and state brutality. "This piece is allowing a lot of people to share a lot of personal and painful stories," said Kajiyama. "I'm hoping that it won't just be a one-way thing where we do the show and the audience passively watches. It's a dialogue." Carter-Woodard wants to raise awareness, as opposed to merely entertaining the audience. "People aren't supposed to leave and say, 'Oh wow, that was a great performance.' They're supposed to say 'Damn, I can't believe that's going on and we're not doing anything about it,'" he said. "The goal is to have people knowing something they did not know when they came." But while he believes that raising consciousness about institutional oppression and violence is a positive thing, he said that the effects of the violence inflicted upon Hernandez Rojas are still long lasting. "This is a wound that isn't going to be healed anytime soon," he said. "Even if we bring awareness and the cops involved get jailed, that's not going to bring him back. It's still going to be a loss."